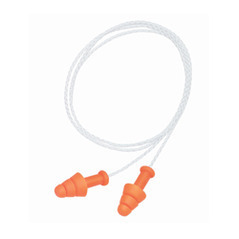 Howard Leight by Honeywell Smart-Fit Reusable Non-Static Corded ear plugs were created specifically for the process industries where static electricity discharges can be devastating. This version of the regular Howard Leight by Honeywell Smart-Fit reusable ear plugs feature a non-static cotton cord and a non-static producing paper bag. Howard Leight by Honeywell Smart-Fit Reusable ear plugs are the only multiple-use ear plugs made with Conforming Material Technology,™ SmartFit uses body heat to adapt to the shape of the ear canal for a comfortable, personalized fit. (NRR 25) Howard Leight by Honeywell Smart-Fit Reusable Non-Static Corded ear plugs were created specifically for the process industries where static electricity discharges can be devastating. Box of 100 corded pairs, each in paper bag. (NRR 25) Howard Leight by Honeywell Smart-Fit Reusable Non-Static Corded ear plugs were created specifically for the process industries where static electricity discharges can be devastating. Case of 500 corded pairs, each in paper bag. Best Pricing!